Flat batteries have a habit of appearing at the most inconvenient of times and can appear without warning. It's easy to leave the lights on or be caught out with a sudden cold snap. 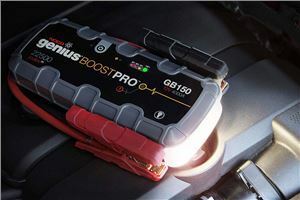 That's why every house and garage should have a jump starter pack on-hand to get you quickly back on the road. Jump start packs have becoime increasingly compact in recent years, which means you should be able to keep one in a glovebox or drawer without taking up too much space. 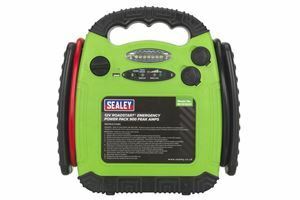 Sealey has a long history of supplying good tools and among its extensive line-up is a range of jump packs. This RS1312HV is an affordable offering that packs a stout peak output of 900A, so it can tackle bigger engines with ease, and it also features two 12V sockets and a USB port – so it can be used to power or charge other things. It is bulkier and trickier to charge than lithium alternatives, though, but it is a durable and guaranteed for a year. 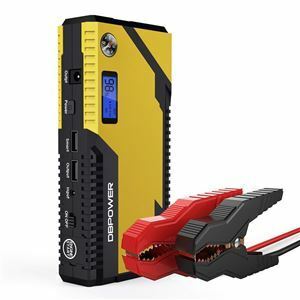 This DBPower jump pack is able to jump start 12V vehicles (up to 3.0-litre petrol or 2.5-litre diesel engines) in seconds with 500A peak current and 12000mAh battery capacity. It can also charge phones, tablets, laptops etc at the fastest speed possible with the included adapters. It's small enough to store in the glove box and the LED Flashlight can switch between lighting, strobe and SOS modes. 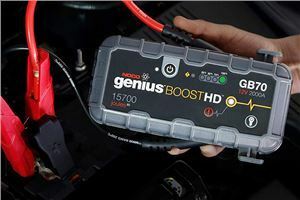 The LCD screen shows the jump starter's working status, while the clamps can provide protection from short circuits, overheating, reverse-polarity, reverse-charge protection, overcharging etc. The DBPower jump pack currently has a 4.6 out of 5 star rating on Amazon from 520 reviews. Okay, so this isn’t a jump starting pack – but bear with us. 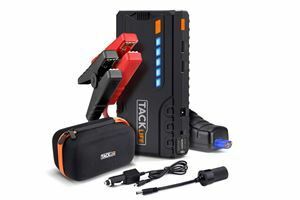 If you've got a car that’s often sitting for long periods, and the battery discharges to the point where you always need to jump-start the car to get it going, it’s worth investing in a trickle charger. It’ll keep the battery in good health and your car will always be ready to go. 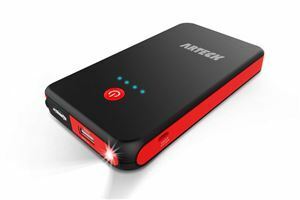 We wouldn’t be without a battery charger and, for £65 (and a five-year warranty), we reckon this is a tough product to beat. It’s sturdy and it works well. We’ve bought several batteries back from the dead. It’s a quick worker as well. Plus, the opportunities for leaving it connected make it ideal for car owners who garage their pride and joy over the winter, or those who don’t clock up quite enough miles to recharge the battery over the course of a weekend. RoyPow J08 is a small jump starter, a power bank and a flashlight. 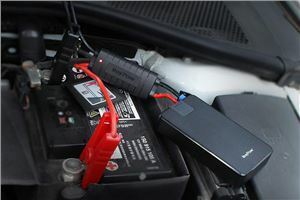 You can jump start a dead battery in seconds, while the clamps offer protection against power surges, overcharging etc. 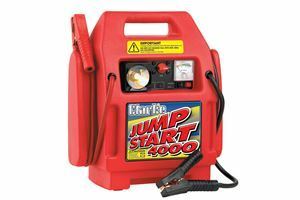 The jump starter pack can jump-start petrol engined car up to 3.5-litres. The 2.1A USB outputs allow for fast charging of phones, tablets etc and there are three flashlights modes for safety if your car breaks down in the dark. The J08 also comes with an 18-month warranty for peace of mind. This compact jump starter is a good option if you’re on a budget. It only puts out a peak of 300A, so it’s best suited to petrol engines displacing less than 2.5 litres – but it may get diesels or bigger engines going if the battery isn’t completely flat. It’s tiny, too, so you can store it in a glove box with ease. Like others, it packs a USB port and flashlight. It even comes with a two-year warranty. If you don’t want to spend a huge amount then this compact TACKLIFE unit could be ideal. It puts out a peak of 600A and it’s claimed capable of being able to handle up to 6.2-litre petrols or 5.0-litre diesels, so it should be able to get you back on the road. Like the NOCO, it also features a host of additional functions – including an LED torch and the ability to charge mobile devices. A six-month warranty is standard. There are numerous compact lithium-based jump packs around these days but NOCO produces some of the most highly regarded units. The GB70 is one of its more expensive offerings but it’s packed with features. For starters, it's rated to put out a hefty peak power of 2000 amps – which allows it to start petrol engines up to 8-litres or diesels up to 6-litres. 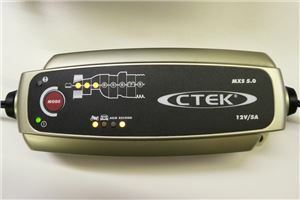 It also has integral 12V and USB connections for powering devices, an internal torch and a one-year warranty. This comparatively inexpensive heavy-duty Clarke starter pack is ideal for those needing to get bigger engines started, as it can put out a peak of 1500A – helping it turn over obstinate engines without hassle; Clarke recommends it for petrol engines up to six litres and diesels up to four litres. It also has an integral light, a 12V socket and an isolator switch. A 12-month warranty is standard. It is heavy, though, weighing a hefty 17kg due to its lead-acid battery. If you want a compact lithium jump pack that’s guaranteed to get pretty much anything going, and you have a big budget, then this NOCO offering could be just the ticket. It packs a peak output of 4000A and, according to NOCO, it can be used to start up to 10-litre petrol and diesel engines. NOCO claims it can do 80 jump starts on a single charge. It has integral 12V and USB connections for powering devices (an iPhone 8 seven times and a GoPro Hero 16 times). It can also be used to power useful tools like tyre inflators. It offers an internal torch and a one-year warranty as well. If you’re looking to cover as many bases as possible then you may well want to get a combined jump pack and compressor. This Suaoki U29, for example, features a powerful lithium battery that can put out 2000A peak and an air compressor; consequently, you’ll be able to sort flats of both the battery and tyre kind. 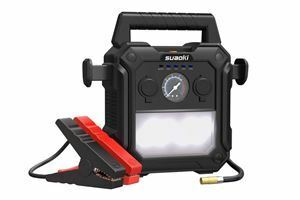 It also has a multi-mode torch, which can strobe or turn red for emergencies, as well as 12V and USB ports. A one-year warranty is standard.